India has successfully tested a short-range ballistic missile capable of carrying nuclear warheads, according to defence officials. 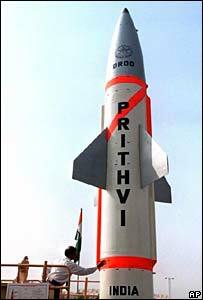 The Prithvi missile was launched from Chandipur in the eastern state of Orissa into the Bay of Bengal at 0955 local time (0425 GMT). It was part of an air defence exercise, and more trials are expected in the coming weeks, the defence sources said. The test comes three days after a missile was tested by Pakistan. The two countries recently announced they would prepare a deal to limit the risk of an inadvertent nuclear conflict. The two sides met in the Indian capital, Delhi, last week for peace talks, the first between the South Asian neighbours since July's train bombings in Mumbai (Bombay). The 8.5m (28-ft) surface-to-surface Prithvi missile covers 150 km (90 miles) in 300 seconds and has a range of up to 250 km. More than 2,700 people were evacuated from the area of the test. Pakistan said it had tested its Hatf V (Ghauri) missile successfully on Thursday. Tension between Pakistan and India - also a nuclear power - has decreased in recent months. The two powers stepped back from the brink of war in 2001. India had blamed Pakistan for involvement in an armed attack on the federal parliament in Delhi in 2001.